Clinton Sparks produces some of the biggest stars in music. Now the Dorchester native is doing his own tracks, and that’s not all. Clinton Sparks was dancing “Gangnam Style” with Korean pop star Psy last week — they’d run into each other in the VIP room of the club Marquee in Sydney, where they both performed. It was business as usual for Sparks, who was on a quick tour around the world. After a show in Los Angeles, he headed to Sydney, then ice skated in an enormous, 24-hour mall in Dubai, and stopped over for a show in San Francisco, where the crowd surprised him by knowing the words to his new single. He capped off the week by getting the last plane out of Newark home to Boston before every flight was canceled for Hurricane Sandy. Although you might not have heard Sparks’s name before, odds are you’ve come in contact with his music one way or another. 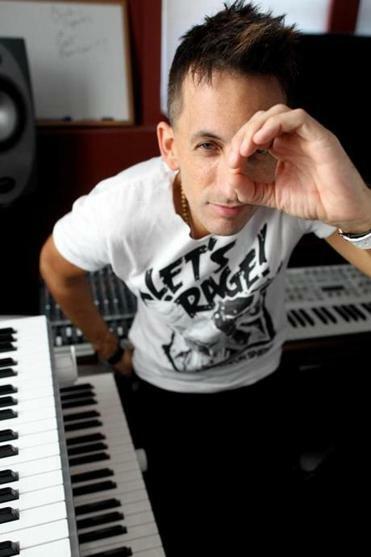 The music producer/celebrity DJ/television personality’s repertoire includes a Grammy nomination for producing Lady Gaga’s song “Bloody Mary,” not to mention writing and producing Pitbull’s “Shut It Down,” and Akon’s “Sorry, Blame It on Me,” which went platinum. He’s also appeared weekly on E! News to talk music, and thrown legendary blowouts called “The Awesome Party” at The Palms and the Hard Rock in Las Vegas — complete with marching bands, cupcake fights, and Sparks himself being lowered through the ceiling from a helicopter. 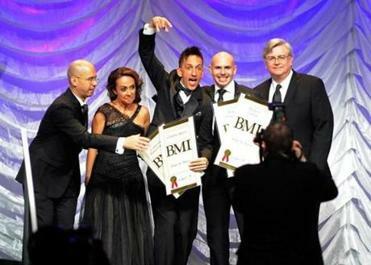 Clinton Sparks (center) at the 19th Annual BMI Latin Music Awards in Las Vegas earlier this year, where he won an award. With Sparks (from left) are BMI executives Porfirio Pina and Delia Orjuela, fellow award winner Armando “Pitbull” Perez, and BMI’s Phil Graham. And with over 205,000 Twitter followers, a radio show — “My Awesome Radio Show,” broadcast here as well as in 22 cities around the world — friends like Sean “Diddy” Combs, and a brand new 6,000-square-foot house dubbed “The Crib” outside of Boston, Clinton Sparks — yes, that’s his birth name — has every reason to live his life like a mogul. And yet, the Dorchester-born Sparks is an anomaly: He spends much of his time DJing in clubs but hates alcohol (his father is a recovering alcoholic). He likes to claim he has “no swag” — basically meaning he’s not cool — and once flew home from Los Angeles for the morning just to make breakfast for his now 8-year-old son. His wife is his middle-school sweetheart. And instead of hoping to get rich enough to buy a few sports cars, he says he eventually wants to use his fame to start a charity called DADD: Dads Against Deadbeat Dads. Over a muffin in a small diner in Norwood, Sparks gets choked up talking about it. Now Sparks, 33, is trying a new role on for size. 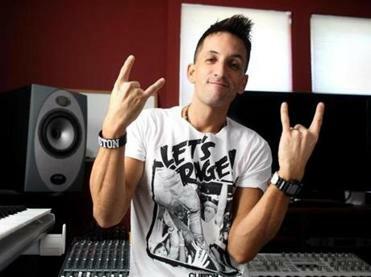 In September, he released what he considers his first “real single” — “Watch You,” featuring Pitbull and Disco Fries, a DJ and producer team from New Jersey. The track is Sparks’s first big step out of the control room and into the spotlight. It took a push from Beyonce, in 2009, to make Sparks consider a change. “ ‘Oh my God, this is a hit record with you on it,’ ” Sparks recalls her saying, after she listened to a demo in New York he recorded for her. A tall but slight man with striking gray eyes, freckles on his pale skin, and a single tattoo — a portrait of his son on his arm — Sparks wasn’t given any handouts to get where he is, and he’s quick to say so. His rise wasn’t an easy one, but it was definitely a calculated one. A troublemaker at a young age, Sparks often had problems with the law. At 13, he came by his first set of turntables by stealing them. After more trouble with the law got his mom evicted, she moved in with her sister in Hyde Park while he, by then 16, spent a winter living and writing music in his beat-up Chevy Blazer, sometimes staying at friends’ houses. Clinton Sparks (right) made a video this past July with Patrick Burns (center) and Millyz. Moving back in with his mom at 18 kickstarted his ambition, and he began making mixtapes of original songs he recorded in her basement. Road tripping up and down the coast, he’d hand them out to anyone who would take one. At the time, Sparks likely didn’t envision his mixes reaching tastemakers like music mogul Combs. “[I’d] heard his stuff and would have never expected it to come from a white kid from Boston,” Combs said in an e-mail. With a bit of the schemer still in him, Sparks convinced record companies that he had his own online radio show. Artists like Common, Eminem, and Sean Kingston would show up at his mom’s Hyde Park house around 2000 to do interviews, and Sparks would run them on the station he then worked at — Hot 97.7. Sparks became friendly with many of the artists, even getting a gig as a DJ on Eminem’s Sirius radio station, Shade 45. In 2004, Sparks began working simultaneously at radio stations in four different states on the East Coast, commuting with his own money while his wife stayed at home with a newborn. Once he became a popular disc jockey, Sparks hoped, other DJs would want to play his own music. Always a step ahead, Sparks made sure his radio schedule mimicked the promo route for touring artists — forcing performers like Pitbull and Akon to see him days in a row. He wound up being the first person to play Akon’s debut single. After Akon told him he owed him one, Sparks showed up backstage at his concert with a record he had written for him. When Akon didn’t take it seriously, Sparks made sure he did. “I’m like, ‘No dude, I’m going to get on your tour bus right now, with no change of clothes, and stay on your bus for six weeks until you cut this record,’ ” Sparks told Akon. After a deal with Interscope yielded a pop-rock CD the label “didn’t get,” Sparks took his music in a different direction. “I’m just getting people warmed up a little bit at a time, a little bit at a time, so I can fully come with, like, a ‘Fix You’-type record, or ‘One’ by U2,” he says. In the meantime, Sparks is still DJing huge parties around the country, headlining an arena show, the Survive Monster Party in Texas, for the first time on Nov. 18. “[Clinton’s] able to keep a crowd regardless of the venue and keep the party entertained the entire performance,” friend and “Jersey Shore” star Paul “DJ Pauly D” DelVecchio said by e-mail. Jason Kennedy, an E! News host who got to know Sparks as the show’s music correspondent, recalled an epic trip to one of his Vegas bashes. Although a CD is in the works for Sparks, titled “Disco Ball and Chain,” he has yet to decide what label to release it on and when. Meanwhile, he’s not stopping with music. Sparks has signed a production deal with the former “Oprah” producer Ellen Rakieten, who told him he’s like “Bethenny Frankel meets Larry David.” Never satisfied with sitting back and letting things unfold, he’s already tweaking her game plan for a reality show, looking to turn the series into a sitcom loosely based on his life.